To encourage as many of the RVS students as possible into music so that all RVS students can have the opportunity to learn an instrument. Certainly God has given music to mankind for our enjoyment and we are to use it for His glory. · Music is another language, the language of the soul - therefore learning music should be a meaningful and joyful experience. A student need not show special talent in order to be eligible for music-making. Everyone has the capability to make music and everyone should have the opportunity to learn music. Sharing music with others is important for improving musical and performance skills: using our talents to bring enjoyment to others is a Godly concept. Learning music teaches many life skills, encourages commitment, enhances memory, gives confidence, and provides many other unique opportunities for growth of character! To contact the Music Academy, please email music@rvs.school.nz. ​Stephanie grew up singing, playing various instruments, and worship leading with both her family and youth bands in church. Music and leading church worship has always been a big part of her life, and it’s something she and her husband Mark (an excellent bass player) are passing on to their four children. Here at RVS, Stephanie co-ordinates the running of the RVS Music Academy, conducts the school’s orchestra and choir, and tutors Guitar and Ukulele lessons. Out in the community, the Ham family enjoys taking part in the local Musical Theatre productions and help with the running of TEMPO (Today’s Emerging Musicians Performing Onstage) concerts held six times a year. Encouraging young people to grow in their musical ability and to perform confidently for the glory of God is a key aspect of Stephanie’s ministry. In her spare time she lets her creativity flow by writing songs and piecing together large picturesque jigsaw puzzles. Peata first started playing the piano and recorder 13 years ago, taking up flute at age eleven and passing her Grade 8 classical piano exam with Distinction in 2017. Homeschooled along with her four brothers & sisters, she has been teaching music to children since the age of 12. She also enjoys languages and drama and has played with several orchestral groups and ensembles, one of which won the secondary schools chamber music award for the Nelson region in 2013. She is currently studying for a Trinity College London music teaching diploma. Alison teaches vocal lessons at RVS. With over 27 years of performing on stage, she has competed in many vocal competitions and performed in over 10 theatre shows. Alison studied vocals and drama at Excel School of Performing Arts, graduating in 2003. Currently Alison is a vocal tutor at Marlborough Children's and Youth Theatre and spends her spare time performing in Blenheim Musical Theatre shows as well as singing in the Worship team at Elim Church. ​Charlotte has been playing saxophone and clarinet for 10 years and piano for 14 years. 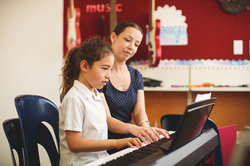 She gained her Trinity College Grade 8 piano in 2014, won the Rotary Scholarship for her contribution to music in the community in 2015 and is currently completing a Trinity College diploma in Piano Teaching. Interacting with people and learning from their many different cultures and backgrounds is a highlight of her home life, where she also assists her Dad in music production and recording. Her other interests include photography, history and tramping. Annie is originally from Edinburgh, Scotland and grew up in a musical family and school over there. She has been playing drums in church worship teams at times, for more than a decade here in NZ, and now plays regularly at Nativity Church in Blenheim and also at her home. Annie is married with four children, with the three oldest at RVS and her youngest says she cannot wait to start here when she turns 5!